Grocery shopping continues to evolve away from traditional notions of the shopping experience, casting some common beliefs in a new light. The cultural context of shopping connects directly to the routines of everyday life. Common household tasks have significant implications for what consumers buy, where they shop. Knowing how shopping fits into the daily routine of consumers is key to understanding shopping behavior. 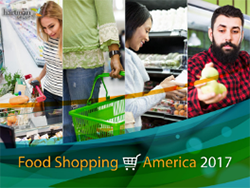 Our Food Shopping in America 2017 report finds that grocery shopping continues to evolve away from the “traditional” vision of a homemaker with her weekly meal plan, list and coupons. With more channels and retailers available, more products to consider and more members of the household participating, grocery shopping has become much more than a simple chore, if it ever really was. Long-term macro shifts in demographics, technology and consumer attitudes and priorities account for this evolution. The Hartman Group’s integrated research approach to tracking how Americans shop for food and beverage has allowed us to identify five general beliefs about shopping behavior that fail to get beyond mere conjecture. 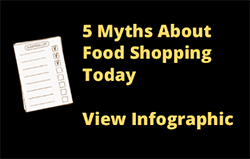 Here we present our perspectives on five of the more common myths about food shopping in America today. Reality: Nine in ten (90 percent) Millennials engage in some kind of planning behavior before shopping — virtually the same as other generations. Millennials, however, are less likely than older shoppers to take the “traditional” planning approach that centers on pantry stocking, list making and checking flyers for sales. Instead, they are more likely to plan around meal plans, recipes and budgets. So it’s not that Millennials plan less, it’s that they plan differently. Reality: Many shoppers have only one type of trip — a medium to small trip in search of some key things for the next few meals and a few other items. This is especially true in urban and suburban areas where shoppers have a variety of options in a convenient radius. A stock-up trip requires more time and energy to plan, which many shoppers simply don’t have. It’s much easier to make more frequent, less planned-out trips. Such trips also allow more purchasing of fresh items — since shopping is focused on near-term needs, there’s less fear that fresh items will go bad if plans change. Reality: This myth has some truth to it — men and women do tend to shop differently. However, we’ve found that these differences likely stem from the fact that women are more likely to be a household’s main shopper and men are more likely to be “auxiliary” shoppers. Main shoppers — regardless of gender — are more likely to browse, factor in prices and sales, use coupons, keep a list and maintain a sense of the household’s inventory. Auxiliary shoppers are more likely to search and retrieve and pay less attention to purchase influencers in and out of the store. Reality: The average grocery shopper doing half or more of their household’s shopping shops 4.4 channels a month. If they truly wanted a one-stop shop, most could probably find one, but they don’t. Instead, consumers expect and even enjoy the differing selection, environments and deals they find at different channels, and they leverage each channel’s strengths throughout their monthly routines. They like the treasure hunt of the dollar store, the specialty products at the natural store, the prices at club and mass, and the convenience of the neighborhood grocery store. Reality: Online’s weakness in fresh is more perception than lived reality, at least for those consumers who shop for groceries online. Non-online shoppers — as well as older shoppers — have strikingly negative perceptions of what online might be better for compared to in-person shopping. However, when it comes to fresh, online shoppers point to simple strategies that help them get the best fresh items, such as ordering from specific retailers they trust through Instacart or Amazon Prime Now. Knowing what’s in season helps, as does communication with one’s shopper/driver. While online shopping may not beat in-person for fresh, for online shoppers, it does the job just fine and comes with other important benefits, like convenience and time savings. How do shoppers shop for food today? 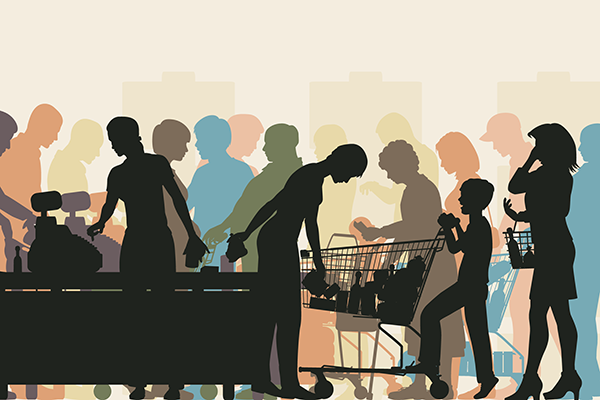 With competition for consumers’ food dollars and eating occasions so fierce, what can food and beverage retailers do to attract and retain shoppers? Food Shopping in America 2017 has the answers!